Fantasia is an extravaganza of sight and sound - brilliantly presented with an all-new digital restoration! Now you can experience Walt Disney's animated musical masterpiece, Fantasia, and the triumphant classic it inspired, Fantasia 2000, together in this special 2-Movie Collection. Fully immerse yourself in the wonders of this innovative blending of music and animated imagery. Audiences of all ages will thrill to the soaring soundtrack and be delighted by the spectacular animation, including Mickey Mouse in his most famous role in "The Sorcerer's Apprentice." Plus, all-new bonus features - including Musicana, Walt's inspiration for a sequel - extend the magic like never before. 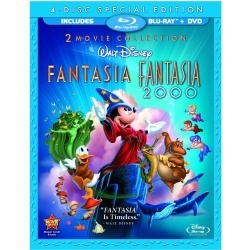 No family's Disney collection is complete without Fantasia! See the music come to life, hear the pictures burst into song and experience the excitement that is Fantasia over and over again.